Chaos doubles with the arrival of the Quarriors Quarmageddon expansion and its 40 new special dice giving life to 6 new Creatures and 2 new Spells. They will allow you to slap the hexahedral monsters on the battlefield. Some seasoned creatures even have a new immunity capacity that allows them to giggle at the futile attacks of your opponents! No danger, no glory! Be careful this game is an extension of Quarriors ! and cannot be played alone. 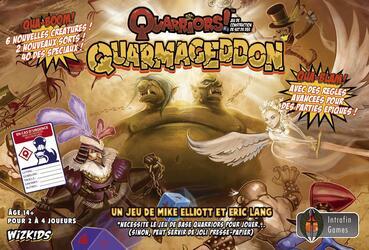 To be able to play it you must have a copy of the game Quarriors ! .